Halloween is one of the oldest known celebrations. Nowadays it is a day celebrated by many people all over the world. People like to dress costumes and put the kids to collect candies on the streets. But do they know its origin? 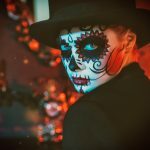 In this article, we will explain how Halloween came about. Maybe the country where Halloween is most celebrated today is the USA. But its roots come from the United Kingdom. “Hallow” is an old word for “saint” and “eve” is self-explanatory. The commemoration always preceded the day of all saints, which is November 1. It is estimated that the first Halloween celebrations happened more than 3000 years ago. Historians find records of a pagan festival held by the Celtic people. The Samhain means “end of the Summer” and used to last 3 days, starting on October 31. It was a tribute to the king of the dead and had the celebration around a bonfire as the main mark. People used to thank for the abundance of food after the harvest. They also prepared for the arrival of winter in a closure and renewal tone. The bonfire has remained as the main tradition of ancient Halloween for many, many years. People burned darnel in it to reinforce the idea of ​​the end of the harvest in Samhain. Fire and smoke symbolized the path that souls in purgatory would have to follow for their evolution. They also believed that the fire was capable of repelling diseases, such as the Black Death. Another activity that brought people together on Halloween was to predict the future. The divinations were as sweet as knowing the name of the future loving partner, even the darkest of predicting the date of someone’s death. For this, people used to tear vegetables off the ground. They then analyzed their format for clues about the future. Agriculture had a very important role to play in these rites of divination. Because it was the main activity of that time, they took advantage of everything. Other rituals included catching apples with the initials of partner candidates and reading the nutshells for even more clues. The ritual that comes closest to what we have today also involved food. They asked the children to chant prayers for the dead from door to door. In return, they would receive cake as a gift from a soul that was delivered from purgatory because of that prayer. In the beginning, the traditions began to be mixed with the habits of the new place. The apples with the initials of the candidates were turned into cider, which was served with donuts. The relationship with agriculture remained strong. Corn, symbol of American agriculture, was widely used in party decoration, with scarecrows included. In the UK, they used to sculpt turnip and put a candle inside. They wanted to illustrate the ancient legend of Jack, a blacksmith who wandered the earth like a living dead carrying a flashlight. In the USA, the turnip turned into a pumpkin, which became the most famous symbol of Halloween. The tradition of “trick or treat” arose in the attempt to calm the mood after violent tricks that were played in some communities. When Halloween came out in the UK, people also had the habit of playing tricks to each other. However, the jokes turned into vandalism during the 20s and 30s, when they were already on American soil. In this way, the old tradition of children chanting prayers in exchange for the cake has become “trick or treat”. The most used costumes are those that have relation with the world of the dead like zombies, vampires and skeletons. Besides witches, of course, as they have always had a very strong relationship with mysticism and ancient peoples. Thanks to intense American propaganda, Halloween has spread all over American continent and today has fans all over the world.